Series of quavering whistles descending in pitch; and a long single trill, all on one pitch. Description: Sexes similar. A small owl. 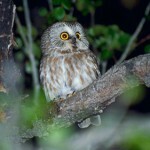 Yellow eyes; usually a pale bill; ear tufts. Camouflage coloring with bars and streaks on underparts, and heavy black streaks on upper breast. Color ranges from gray to brown to rusty. 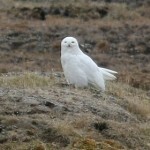 Habitat: Occurs in a variety of wooded habitats, including farmyards, orchards, and cities. 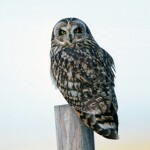 Where in Nebraska: Probably more common in cities than in heavy woodlands, where it is preyed upon by larger owls. Common permanent resident in wooded areas across the state. Rare or absent from treeless areas. 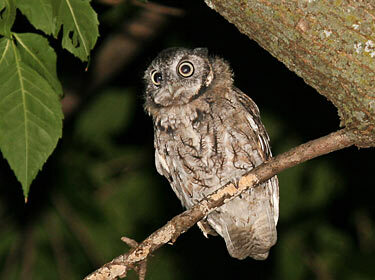 Eastern Screech-Owls do not actually screech. When threatened, an Eastern Screech-Owl will stretch its body and tighten its feathers in order to look like a branch stub to avoid detection. It will take flight when it knows it has been detected. Eastern Screech Owls are usually monogomous and stay together for life, but occasionally one male will mate with two females.